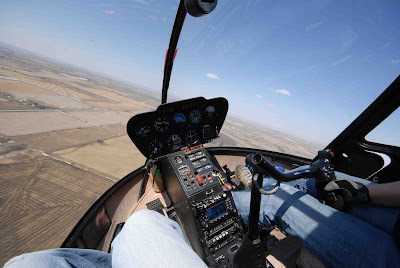 Our good friends, Ian and Debbie Ross and their daughter Ella, were patient enough to stand in line for a couple of hours this weekend just gone, to get a chance to take a helicopter ride over Okotoks. From these pictures they have been kind enough to share with us, it seems it was well worth the wait. In this shot, the helicopter is in the North East of the town, right above the Air Ranch community. The helicopter is facing south-west, giving a view right down over the town. Towards the top of the picture, snaking its way from left to right, you can see the tree lined Sheep River valley that divides the north and the south of the town. As previous blog items have noted, this is a fabulous spot for walks along the river and in summer, you will often see children and adults alike, resting and playing both in the river and on its banks. A number of Eamonn’s real estate clients will recognise their beautiful homes in this shot! This next one is a terrific shot that will help those new to or thinking about moving to Okotoks, get a feel for the Crystal Shores area that is so popular. Apart from being able to see our BBQ on our deck at the back of our house (you never know who is watching you do you! 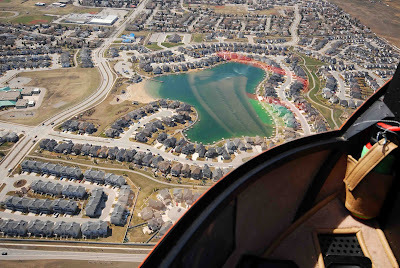 🙂 ), you can see the Crystal Shores lake and its beach and beach house. You can see all the walking paths and green spaces that are designed into the community and on the left of the shot, you can clearly make out the part green roof and large grassed and banked (makes for great sledging in winter) grounds of Dr Morris Gibson Elementary School, which is such a draw for people moving to the area with younger children. The bright blue roofed building is the Fire and Emergency Medical Services Building and just beyond that and left is the excellent Okotoks Recreation Centre. 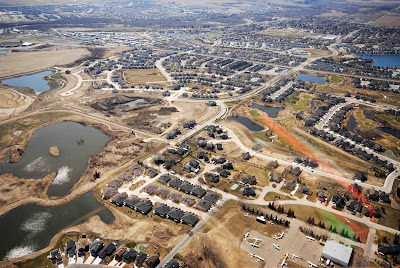 This final shot shows something that we really love about Okotoks…the fact that it is surrounded by wide open space. Great shots Ian and Debbie…thank you for letting us blog them.